While typical stable organic and many stable inorganic molecules have closedshell ground states, interesting chemistry and molecular physics is by no means limited to these species. For example, O2 is a common molecule with a triplet ground state and whose spectroscopic importance is dramatically illustrated by its role in the photochemical explanation of the aurora borealis, and the ultraviolet spectra of the high spin d6 complex that ferrous cation forms in water, [Fe(H2O)6]2+, is a source of information for fixing ligand field parameters. Excited states of molecules with open-shell ground states also appear as higher energy peaks in photoelectron (ionization) spectra. Moreover nearly all of photochemistry involves some nuclear configurations which may be qualified as having open-shell ground states. It is small wonder that Casida’s equations [Casida 1995a] began to be applied to calculate the spectra of open-shell molecules just five years after their introduction [Spielfiedel 1999, Hirata 1999a, Hirata 1999c, Adamo 1999, Guan 2000, Radziszewski 2000, Anduniow 2000]. 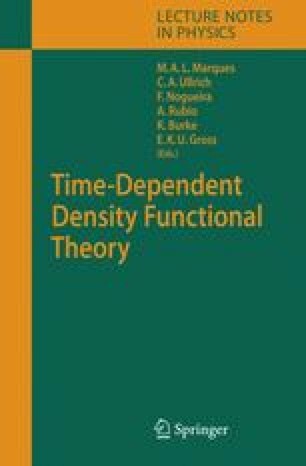 While it is safe to say that the initial developpers [Casida 1995a, Petersilka 1996a, Jamorski 1996, Bauernschmitt 1996a] of linear-response time-dependent density-functional theory (LR-TDDFT) for the calculation of excitation spectra were thinking about applications to molecules with closed-shell ground states having the same orbitals for different spin (SODS), the original formulation of Casida’s equations foresaw their eventual application to molecules with an open-shell ground state by allowing both for different orbitals for different spin (DODS) and for fractional occupation number [Casida 1995a]. Application of the DODS formulation of Casida’s equations has led to spectacularly good agreement with experimental spectra in some cases and significant errors in interpretation of calculated results in other cases. This chapter tries to point out where DODS LR-TDDFT is a reasonable approach to the excited states of open-shell molecules and where it is likely to fail. In the cases where it is likely to fail, we give an indication of how the theory may be fixed. Some of the results reported here come from our own unpublished work [Cordova 2006, Ipatov 2006]. Although we do not have the space here to go into the details normally expected for new work, we trust that fuller accounts will eventually be published elsewhere.